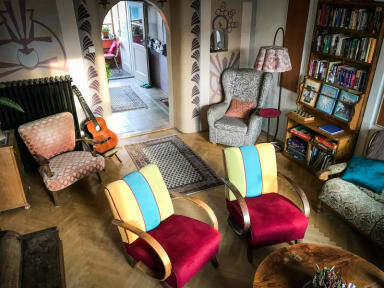 Located in the historic centre of Olomouc, this retro-styled backpackers' hostel located in converted flats on the 3rd and 4th floors of a turn-of-century building offers dormitory and private rooms, free Wi-Fi, shared kitchen areas and an inviting common room to relax in. We offer plenty of information about the city and region, as well as a plethora of amenities, such as free tea and coffee, a book swap, board games for those rainy days and laundry service for when you need to freshen up. The colourful and stylised rooms at Poets' Corner Hostel have wooden floors, oriental carpets and vintage furnishings, with a few of the rooms and the balcony looking out onto Saint Wenceslas Cathedral and Holy Hill in the distance. All private and dormitory rooms here have shared bathrooms, and the communal kitchen facilities provide the perfect place to cook up a meal and meet new friends. All bedding is provided, and towels are available free upon request. It's easy to get to and from the hostel, and there are tram and bus stops just round the corner. The centre of town is just a 3-minute walk away, allowing you to quickly get to all the restaurants, cafés, pubs, shops and cinemas that Olomouc has to offer. We are also at the crossroads to other great places like Kraków, Vienna, Bratislava, Budapest, Prague and even the Tatra Mountains! This is the best hostel I’ve stayed at on my euro trip! Ian and Klara are so wonderful and the hostel is so homey ! It has a relaxed, comfortable vibe. Great for a solo traveler as it is small and you will easily be able to meet people. Can’t recommend this place enough! Great hostel in Olomouc! I celebrated New Years with amazing people and lots of fun! I really wish I could have stayed more days there ! 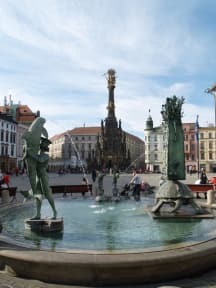 I loved my stay in Olomouc! The staff at the Poet's Corner is so nice, and they have a ton of information about the city. It's very walkable and easy to take the trams. I will definitely stay here when I come back to the city! Thank you! I absolutely loved my stay here, the hostel felt like home and the facilities were all lovely and clean. Definitely would recommend this hostel and Olomouc to anyone in Czech Republic, it's a great city to explore and the hostel staff were very helpful with recommendations. This hostel felt more like home than my actual home! The staff is incredibly nice, willing to answer all my questions, and gave great recommendations. The two day minimum was most definitely worth it to be able to stay at this place. The hostel was decorated in a colorful and classic, retro-feeling design. It was pretty quiet and very laid back, by far the most stress-free hostel I’ve had. I cannot recommend this place more! One of the best hostels I’ve stayed in after 6 months of traveling. Hostel is basically a 3-br flat and feels like home. Ian and his staff are incredibly welcoming. Hostel is only a few minutes from Old Town and super close to the tram line to get to the train station. I would absolutely recommend this hostel to anyone looking for a home away from home where you can meet great people and see beautiful Olomouc! Really nice place to chill in between the big cities. I was only meant to stay one night but felt so at home I stayed a second night. The whole team are so lovely and gave me free beer and wine so I felt sorry included. I'll defo be back! Awesome hostel, small but it's like staying at a friends. Great atmosphere and host was super friendly, knows the town really well. Fantastic staff, wonderful atmosphere. Such a great vibe. For me, the bathroom facilities and cleanliness could be improved, but I am particularly fussy on this. The people there were truly fabulous and it had such a laid back feel. Very comfortable.